*Pricing may vary depending on design modifications and options selected. The Limousin Bull Weather Vane pictured includes the ranch name in optional gold leaf lettering on the arrow fletching. The customer who commissioned this sculpture piece requested a heavily muscled, mature bull Limousin. Because our weathervanes are crafted to order, each vane can be personalized in accordance with a customer’s wishes. For example, another customer wanted us to depict a younger Limousin. For his bull, we did much smoother and supple shaping to give it a feel of less bulk. Depending on the extent of the modifications, there may be some additional cost involved in redoing the original design for customer approval prior to starting construction. The Limousin breed originated in the Aquitaine region of France and has been exported to many countries throughout the world. This ancient breed may have even been the model for the bulls depicted in the famous Lascaux Cave paintings, dating back 20,000 years. They were bred both as work animals and as an important food source. Later the focus was on their value as a food source and they were increasingly bred for deep chests, a strong tip-line and strongly muscled hindquarters. You can see those characteristics reflected in this weathervane design. 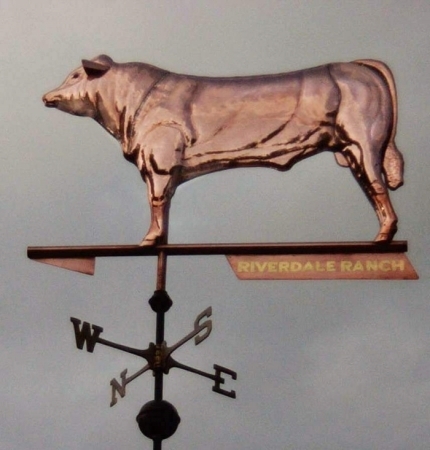 West Coast Weather Vanes specializes in custom design work so if you have a breed of cattle you would like made into a weathervane, please let us know. We have had extensive experience creating specific breeds of not only cattle, but horses, goats, dogs and cats as well. Just give us a call and we would be happy to explain how to get the perfect weathervane for your installation.